Great Lakes Lacquer - Sunset Dissected Collection - Polish Etc. A double post for you all on this fine first day of March. I have a new collection from a brand that I haven't reviewed on the blog before. I have been posting photos and reviews on my Instagram page for Great Lakes Lacquer but felt it was time these pretty babies made a debut on the web. 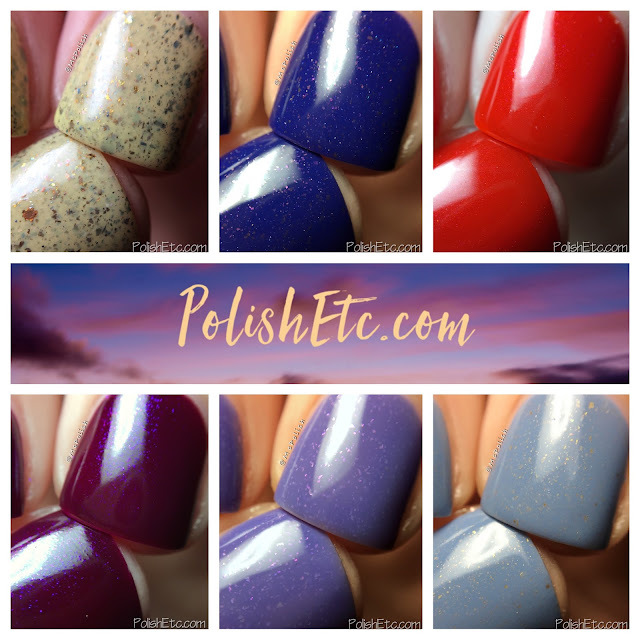 Great Lakes Lacquer is fairly new to the indie scene but they make amazing shimmers like you would expect from seasoned vets. This new collection, The Sunset Dissected, has a nice range of crellies and shimmers is sunset inspired colors. Let's take a look at these lovelies! Click through for the sunset! "The Last Sliver of Sun" is a dusty pale yellow crelly packed with small multichrome flakies in bronze, gold, green and burgundy. 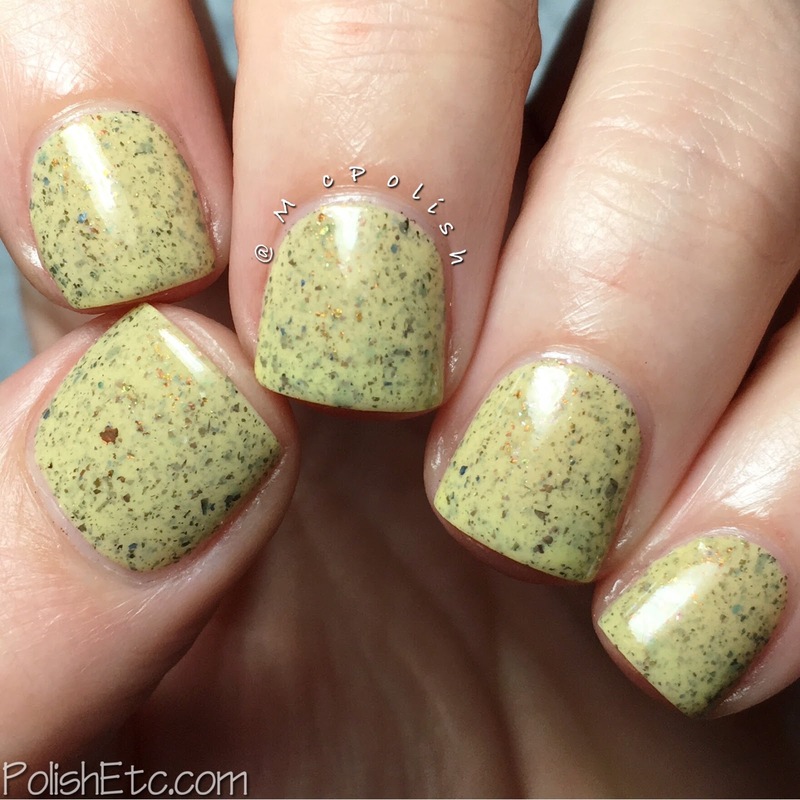 This polish look much more green in the bottle but definitely yellow on the nail. For a pale yellow polish, the coverage was good. I used three thinner coats with a glossy top coat. 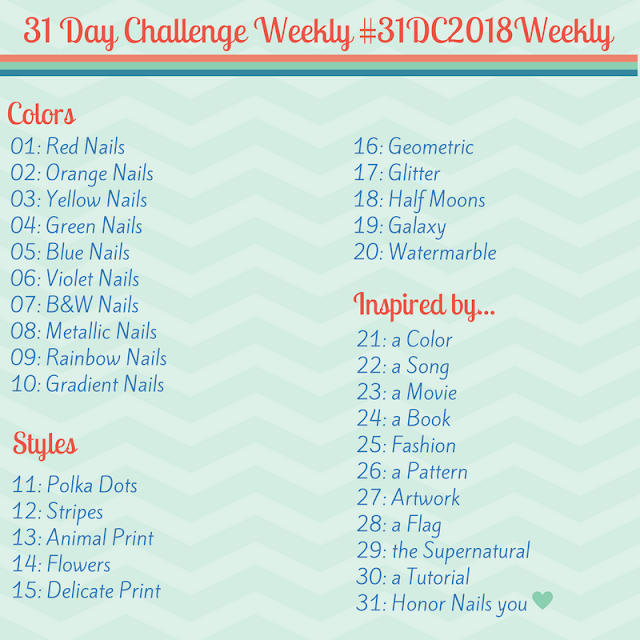 The flakies distributed nicely on the nail and didn't clump up. Approved! "Last Remaining Light" is a deep but bright blue that leans a little purple that has a pink to green shifty shimmer. There is a slight holographic shimmer at certain angles as well. This color really captures the look of the shy at twilight very well. The formula was nice and I only needed two coats for full opacity. This is also topped with a glossy top coat. 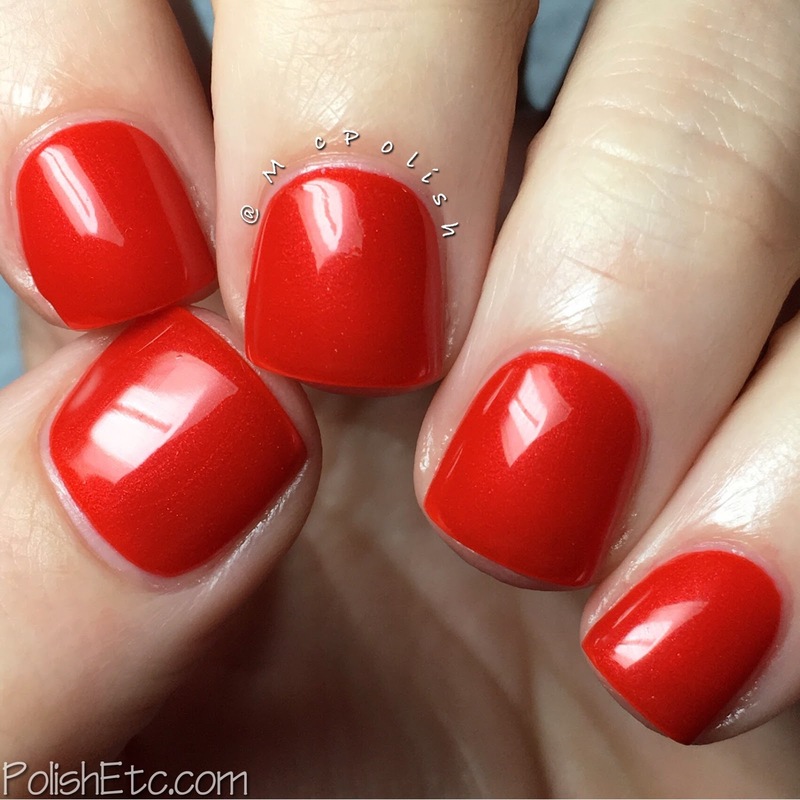 "Sailor's Delight" is a bright, fiery red jelly with a slight sheen. The shimmery effect is very subtle and fine. The formula was nice and squishy but a little bit sheer. I did three coats with a glossy top coat for this swatch and you can still see a little bit of my visible nail line. But the color is amazing! 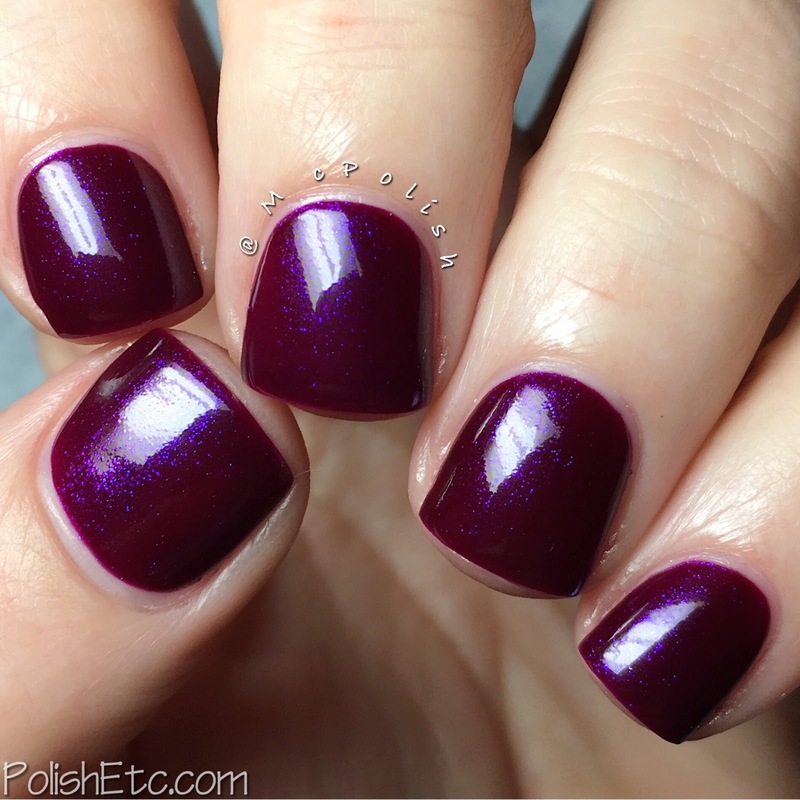 "Washed in Magenta" is a bright red toned purple (aka magenta) jelly packed with bright blue/purple shimmer. Wow! this polish really glows from within. I had a horrible time trying to capture the beauty of this polish. That blue shimmer just pops! It is a squishy delight. I did two thicker coats with a glossy top coat for this swatch. "Lavender Light" is a medium lavender crelly with pink and gold glass flecks. The pink flecks look great against the lavender backdrop here. Again, perfectly squishy formula that was opaque in two coats for me. I like it! "Disappearing Daylight" is a dusty sky blue crelly with a sprinkling of bronze and gold shimmer. The shimmer particles are slightly larger which give this a cool effect. I only need to two coats for full opacity and topped it all off with a glossy top coat. I have been really enjoying these dusty shades lately. A really nice collection! I think Last Remaining Light is my favorite. Oh yes...that one is a great one. Thank you Amy! <3 Outstanding swatches, as always. You must come and teach me how to shape my nails. I'm HORRIBLE at it.